Question: How can you say that Bharat’s national security is in severe trouble? Answer: When foreign nations influence & control the upcoming elections. Back in February, when I came across an article from Times of India Startups, which says Chinese tech and media companies back news apps in India, where most of the leading News apps are mentioned to be funded hugely from Chinese companies, it did not strike me as a matter of concern. But, suspicions have aroused in May, when I read about the reports from Australian government and intelligence, claiming that China is influencing its politics and all levels of government for a decade. And in July, Rajya Sabha MP Narendra Jadhav in his interview given to Indian express regarding Alibaba’s stake in Paytm, claimed that the Chinese Communist Party is seeking a direct role in influencing decisions made by multinational companies like Alibaba. In the interview, Jadhav expressed concern for accessibility for Chinese companies to millions of Bharatiyas financial data, which is a risk to our national security. But, when the same multinational companies have also been hugely funding in Bharatiya digital News media, does the risk confined to investments only in the financial sector? Connecting the dots, I eventually landed on the most disturbing question-What if China plans to wage a cyber-propaganda in Bharat by investing in its digital news applications? What is the scope? Can we realize the foreign interference in Bharat’s sovereignty while it’s happening? What could be the possible repercussions? Let’s delve into foreign majority-owned Bharatiya News app market. Newshunt, which was invested by China’s Byte Dance in 2016 for 25 million dollars on record, has over 50 million user base in Google play alone. I even found that Ali Baba wants to acquire a minority stake of 10–12% in Newshunt, where it has reportedly offered 500 million dollars proposal for this Bangalore based startup. And the other foreign investors associated with Newshunt are Sequoia capital, Falcon edge capital, Matrix partners, Omidyar network and Darby overseas investments. In shorts, a significant player in the mobile news media was financed up to 29 million dollars in multiple series of funding led by an American investment company, Tiger Global. Newsdog, one of the topmost News applications, claiming around 50 million user base in Google play in Bharat, is not only backed by Chinese giants but also owned by a Hong Kong-based company, hacker interstellar. It is indeed the Bharat’s version of Byte dance’s Chinese app Toutiao. I also found that Tencent, a Chinese internet giant has invested around 50 million dollars in News dog this year and also the Chinese mobile app developing and publishing company, Dot C united group has a significant stake in it. And other investors associated with Newsdog are DHVC-Danhua capital and Legend capital. On top of all, UC news, a service provided by UC browser which was owned by another Chinese business giant Alibaba, has acquired the user base of over 100 million in Google play in Bharat, the highest user base than any other news applications in the country. When 87% of Bharatiya Digi-population are accessing the News content online, of which 91.5% is accessing via mobile devices, I can see that these mobile news applications, with the vernacular approach, acquiring a significant proportion of digital News media market all over the country. In fact, if we list out the new-age news apps in Google play with at least 10 million user base in Bharat, there are only three News apps, Newspoint by Times Group, Jio News Express by Reliance and Way2News by Way2Online, which are backed by domestic investors, while the rest are either owned or funded by foreign investors, mainly Chinese. Kindly invade into our digital News Media! : Bharat to Foreign countries. Post-BJP came into the power, although the FDI caps were increased dramatically in many crucial sectors, the segments of traditional news media was fixed to only limited percentages of equity allowance. In the segment of print media, for News and current affairs periodicals or any publication of Bharatiya editions of foreign magazines, the FDI equity share is limited to only 26% and the company needs to take Government route for approval. 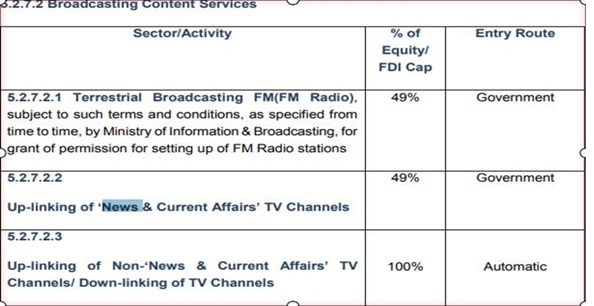 And in the segment of broadcasting media, FDI inflow is checked at 49% of equity share for FM radio and uplinking the News-current affairs TV channels, subject to government approval. But in contrary to above, when it comes to the Digital Ecosystem, there is no regulating body acting upon the foreign funding in Bharat’s News media or the foreign media spreading over the Bharatiya digital market. Moreover, the FDI policy released in the year 2017, embraced the 100 % equity share allowance to the startups, which hiked the funds flowing into the Bharatiya digital News media, along with other digital forums. If the government regulates the FDI in traditional media by considering it as a powerful tool which can sway the public opinion, then why not the similar crisis is identified with Digital news media, especially News applications? It is the kind of opportunity, the dragon seeks for. “Unlike Russia, which seems to be as much for a good time rather than a long time, the Chinese are strategic, patient, and they set down foundations of organizations and very consistent narratives over a long period of time,” said John Garnaut, a former China correspondent for Sydney Morning Herald and former principal advisor for department of prime minister and cabinet of Australia. Considering the conditions in which the Chinese companies work, it is evident that the governing communist party in China asserts control over every key decision of the business operations and their investments in the foreign nations. “No company, private or state-owned, gets ahead in China without aligning itself with the party’s larger goals’’, said Trey McArver, co-founder of consultancy Trivium, China. It is to be noted that Google left its operations in China, rather than providing access to the user data on demand to the Chinese authorities. And, according to Shaun Rein, managing director of China Market Research Group, to remain in favor with the government, the three Chinese techie giants Baidu, Alibaba, and Tencent have been careful to demonstrate loyalty to the Chinese ruling communist party. And Alibaba and Tencent are the companies, which now, are growing as major players in Bharatiya digital news media markets, making investments massively in News apps. On top of all, I could also see that Alibaba and Tencent have been consistently investing in other Bharatiya digital startups like Snapdeal, Paytm, Ola, make my trip, Hike, Practo, Goibibo, etc., which allows them to have access to the data of millions of Bharatiya population on those platforms. Now, imagine the consequences with the congregation of that million of data and news as a mainstream weapon in the hands of China, which it can use to run influential campaigns in Bharat, with much higher impact and range than in social media campaigns. 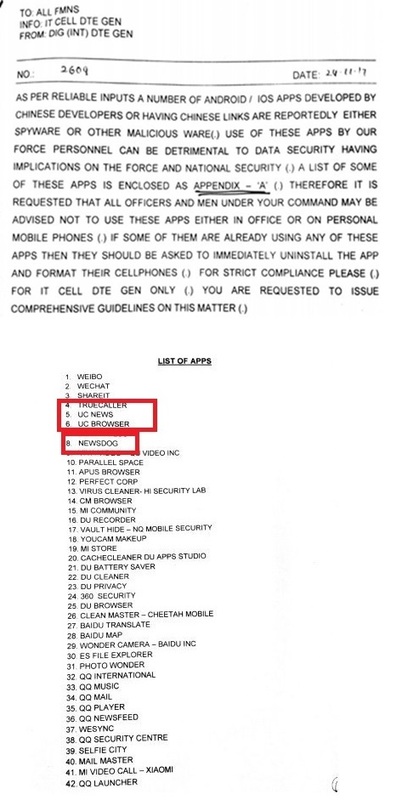 Moreover, in the year 2017, the two top News apps in Bharat UC news, which was the service of UC web and News Dog, are listed in the 42 apps, which are identified by Bharat’s Intelligence agencies as either spyware or malware and issued a warning to the Bharatiya army and parliamentary against their usage. But, even then, why the government did not take any action subjected to the common public of Bharat, where those apps are in heavy usage? In cyber propaganda, the ordinary public becomes the primary target, where the internal security is no more restricted to only military and parliamentary arenas. Unlike the other cyber warfare techniques, the cyber propaganda in the hands of an enemy nation is an invisible and undetectable war tool in the disguise of most genuine-looking, hooking and influential content. Interference in the internal political decisions, propagating the fake news to fuel up the fire between different communities, negative propaganda regarding the Government’s stance on international affairs, inducing Anti-national ideologies with biased and persuading content, etc. are some of the strategies of cyber propaganda, which creates social and political instability in the targeted nation. And in the worst case scenarios, even the governments can be overthrown, and elections can be intruded with influential campaigning. However, the awareness about it has spread around the world with the incidents of Russian meddling in US election in 2016 and Cambridge analytica, where the social media has become the platform to run influential campaigns against democratic party, favoring Donald Trump. But, what if the same happens in mainstream News apps, which may likely to occur in Bharat? Regarding content, social media have immense space for trolls and fake news, which is less experienced within News apps. But, it is also what makes News apps more genuine and authentic than social media. While most of the users already have an impression on social media platforms as fake news propagators, most of the times, the targeting communities will be limited to only those who need confirmation biased news. Whereas in News apps, the enemy nations can do much targeted and personalized campaigning either to suppress or to activate an ideology, based on the data tracked about the reader demography and the intensity of political interests, while most of the readers give the benefit of the doubt. Moreover, Chinese communist party, which is known for its mastery over biased propaganda, can use these news apps to their maximum potential for their psychological stunts to shape the perception of Bharatiyas according to their choice. Even tracking tools can be used to analyze how the content is being received and further refine it accordingly. And these campaigns will not be confined to only national level parties, but China can also favor the chosen party’s alliances at a regional scale if it can access the location data of audience via News apps. Which means, the hyperlocal campaigns can also be run by the Chinese intelligence to target the voters at constituency level, where the vernacular news apps have penetrated more. Once, the foreign players start their game in our internal affairs, then that will be our beginning to lose out our national strategic interests, which is now, the countries like Sri Lanka and Venezuela are experiencing with Chinese economic dominance. In such a scenario, when Modi government is determined for strong digital infrastructure in Bharat, it needs a comprehensive cyber defense system, with the inclusion of regulations to curb the possibilities of cyber propaganda in the online news media platforms, while the general elections are also approaching. When a nine-member committee was formed by the information and broadcasting ministry of Bharat, as the first step to draft new rules and regulations for online media, critics like Mr. M. K. Venu, the founding editor of ‘The Wire’, has expressed concerns regarding subjugating the freedom of press and attacked Modi’s government for taking the initiative. But, I would say that, firstly, the necessity to control the fake news or biased news propaganda in online media is not pertained to a single political party, but to the whole nation, irrespective to the party they support. Secondly, we can see that the norms set to traditional media regarding licensing, content creation, foreign investment policy, etc. have not refrained it to voice out its opinion freely, but controlled the foreign interference and fake news propagation, for which the online media has become the home. 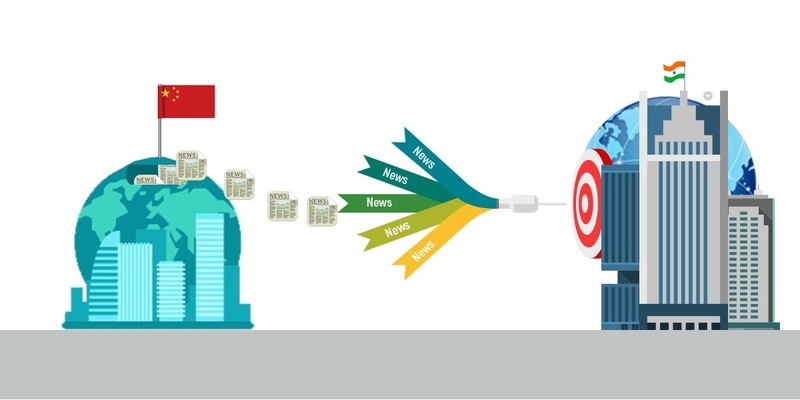 Thirdly, although we can see the biased news culture in traditional media channels, in the current global scenario, it is incomparable to the the intensity of damage that can be created by the same with the involvement of foreign intelligence using digital news media platforms. I would say that, the chaos that can be created by the enemy nations like China, which can have the Bharatiya digital news media market under their control sooner, will be much dangerous and damaging scenario to the Bharatiya national security when compared to the disturbance caused by FDI caps. The freedom of the press needs to be maintained, but it should not make us blind and become a weapon for foreign invasion into our sovereignty. As said by senior journalist Ishwar Daithota, allowing foreign direct investment in the media is like inviting foreigners to sit in Bharat’s Parliament.